When a searcher types a search query into Google, they are delivered to a search engine results page (SERP). This page consists of what Google thinks is the best match for what you the searcher is looking for. As businesses, we often neglect to recognize the importance of a SERP – especially the first page of a Google search result. Most consumers search for a specific product or service – such as ‘women’s handbags’, or ‘financial advisors near me’ when conducting a search on Google. They do not search for a business name – they search for what they want to buy. It is crucial that you recognize that new customers do not know your business name, so they search for the categories, products or services you provide. And being shown on page one of a SERP is key to getting that new customer. It is important to note that over 95% of all traffic only ever sees the first page. If your business is not on page one, you are pretty well invisible and definitely missing out. So the question is: how do you get on the first page more often? The answer: give Google what they want, the way they want it. Google wants to deliver the best experience possible to the searcher, and the basis for that experience is accuracy and trust. Google is the dominant tool used by consumers today, allowing them to set their own rules – meaning if you want traffic from them, you simply must play by their rules. So What Are Google’s Rules? To Google, your business is recognized by two things: your Website and your GMB listing. Your Website: Google is not about pretty – it’s a computer and has no emotions. It runs on data, pure and simple. Google bots crawl and index your website based and the content you provide on that site. You need to have the site properly formatted to make it easy for bots to do their job. Mobile enabled, schema markups, site maps, https, breadcrumbing. It’s a long list but when you do it right, you have a better chance of getting onto page one – and that means more new customers. 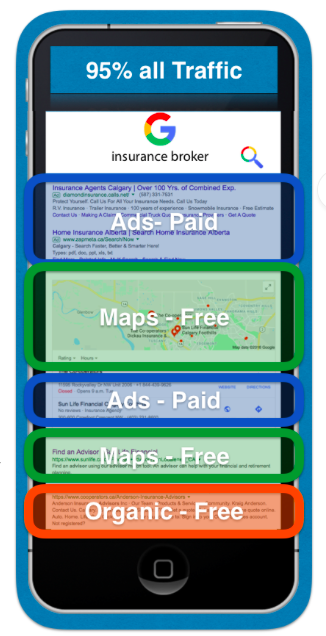 Your GMB (Google My Business) Listing: Google considers each physical business a point of interest on a map. You must connect your business address to Google through a Google My Business listing. Claiming and consistently updating a GMB listing helps you rise to the top, and get more new customers. You need to make it easy for Google to trust your business over your competitors. This includes telling them what your business does, and proving them with proof that your company is still active, at the location they have on record. And, as always, you can pay them through Google Ads to accelerate trust in your business. Your first step is to make sure your NAP (name, address, phone number) data is absolutely the same on your website, your GMB listing, and everywhere Google finds your business listed on the Internet. Anytime there is conflicting information (like a different business name or address), Google gets suspicious and their trust in your business goes down. You get ranked lower, and someone else gets that customer. Remember – it does not matter that you don’t use foursquare or Instagram – your next new customer might, and Google definitely does. Ensuring consistent data throughout the entire search ecosystem is critical to Google trusting your business. The surest way to build trust in your business is to run a small local Google Ad campaign. You do not need to have a huge budget, simply running a small campaign helps. It will not only pay dividends in the form of guaranteed exposure and traffic, but nothing tells Google you can be trusted like becoming a repeat customer. You do not have to be the most trusted, you merely have to gain more trust than other small businesses in your industry. It’s a game of first mover advantage – so the earlier you start building your Google reputation, the quicker you receive the advantage​ and will continue to over time. If you’d like to start improving your digital footprint, check out our Local Search Modules – automated tools that help small businesses succeed​ in search.